Google announced a major search engine algorithm update that spells out impending doom to all web sites that are not “mobile friendly”. On April 21st, Google will penalize all non-mobile friendly sites on all mobile search results. About 50% of total web traffic today is from mobile devices. What will happen a web site is not “Mobile Friendly”? If you search on Google, from your phone or tablet, it will be nearly impossible to find non-mobile compliant Web sites. These non-mobile friendlym or non-responsive web site sites will likely take a hit in desktop organic search also, but that has not yet been confirmed. You should work toward having a mobile-friendly website by April 21 otherwise you may very well experience a dramatic decline in website visibility. 1. Search for your web site on your phone or tablet. 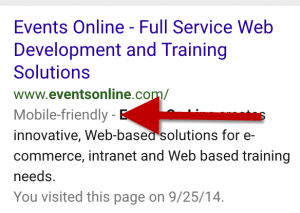 Do you see a “mobile friendly” under your web site’s search results? 3. Call Events Online to discuss options to take your mobile friendly. There are some plug-ins or code that can provide mobile options.